For drilling out tubular locks when key or pick are not available. 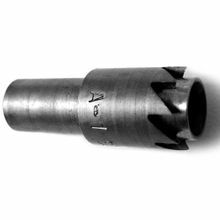 A-1�s unique Tubular Saw cuts away the shoulder over pins to allow them to be removed and the lock opened. Pins remain intact for decoding. This saw will open locks with ball bearings in the keyway, but should not be used on locks with dead pins. Cuts brass or steel #137 standard locks at low speed. Not returnable as are all lock pick products.